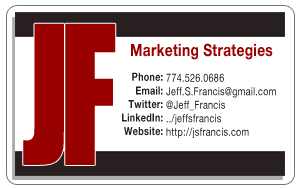 I am available for all your marketing needs. Branding, RFPs, or custom research issues? Give me a call. I can help with everything from ensuring you get important deliverables on your customer survey to developing content for a company newsletter. Please send me an through any of the sites linked under contact info to the right. I look forward to working with you. You can get to know me better in these places too!